In a previous post, we shared about Cashalo as another alternative for online cash loan. As of that posting, Cashalo was still not operational. The good news is as of this writing, Cashalo is up and about, and ready to offer online cash loans for you. Here’s what you need to know about Cashalo, plus a step-by-step guide on how to apply for an online cash loan. 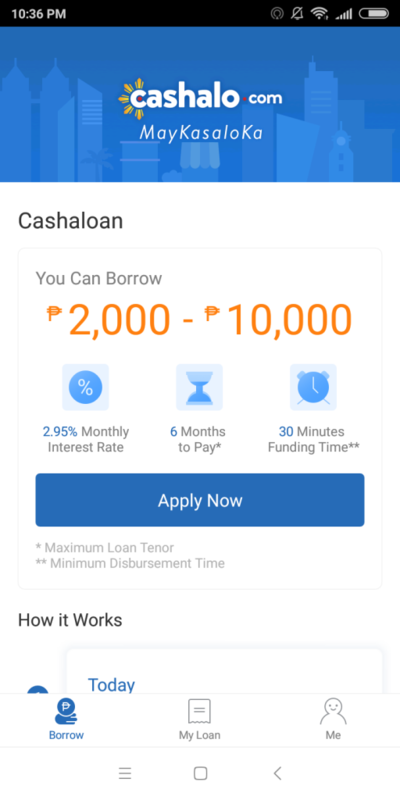 Cashalo is an online marketplace that allows Filipinos to collaborate for financial services where you can borrow between P2,000 and P10,000. Unlike other online lenders, Cashalo allows both lenders and borrowers to connect. As long as you are over 18 years old, employed, and with a steady income, you can apply for a loan through Cashalo. Download the Cashalo app for free. You can get it at Google Play Store for Android devices or App Store for Apple devices. 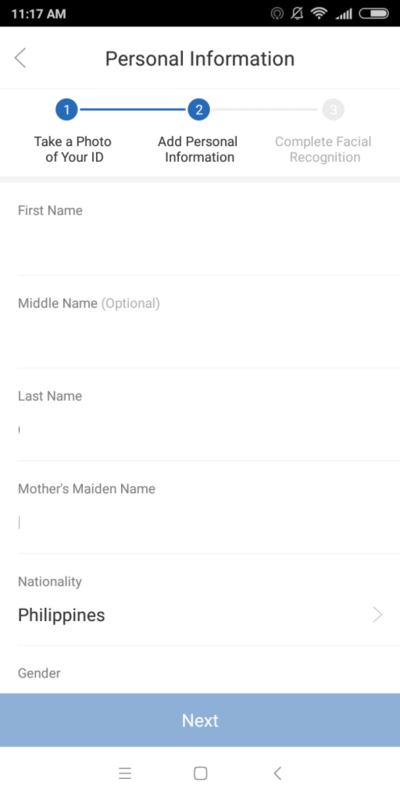 Once you downloaded the app, you have to Sign Up using your mobile number. A six-digit code will be sent to you to verify your mobile number. Key it in. Enter your username and create a password. Click “Sign Up.” Make sure you write down your username and password for future reference. You will be redirected to Cashalo Homepage. Click “Apply Now” to apply for a loan. Choose a loan amount between P2,000 and P10,000 and then select the loan term. 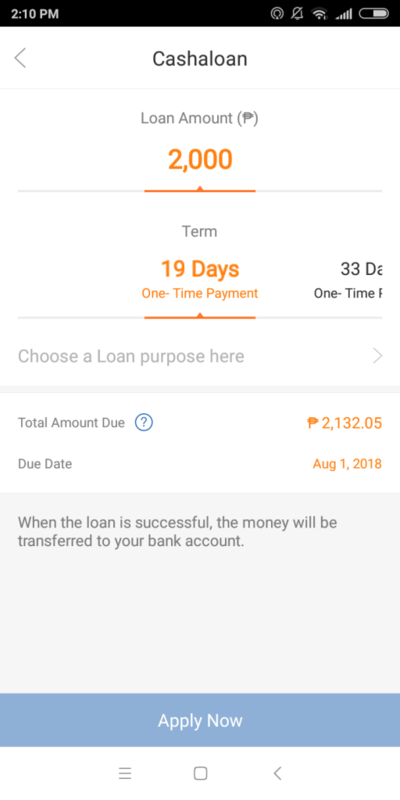 Loan term is maximum of 33 days. As you navigate, you will see the total amount due on the lower portion. Click “Apply Now” thereafter. Input your Personal Information such as name, place of birth, and marital status. 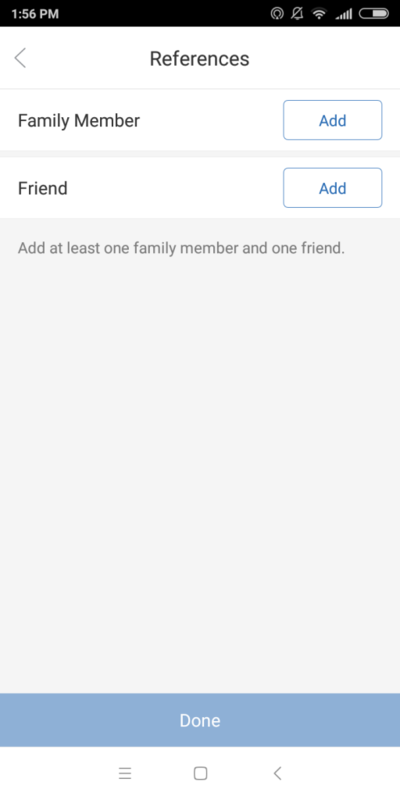 Provide References, specifically at least one friend and one family member. Fill out Work Information details, which includes occupation and employer or company. 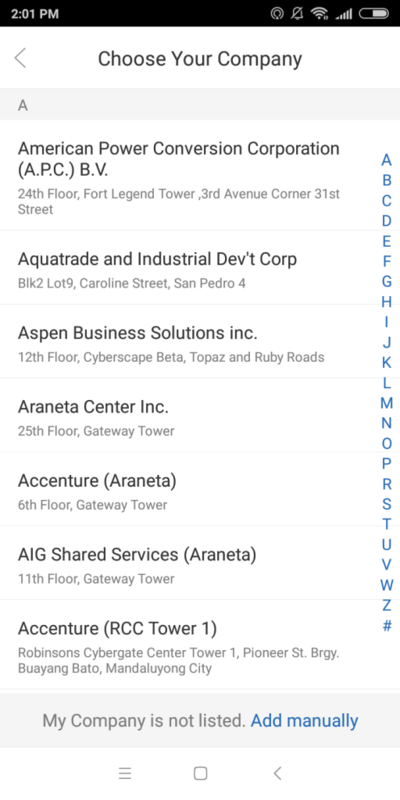 Take note that Cashalo has pre-installed companies. If you can’t find yours, you can add your employer manually. Input your bank details. Unlike other online cash lenders, Cashalo will only remit the amount you borrowed by depositing the said amount in your bank account. 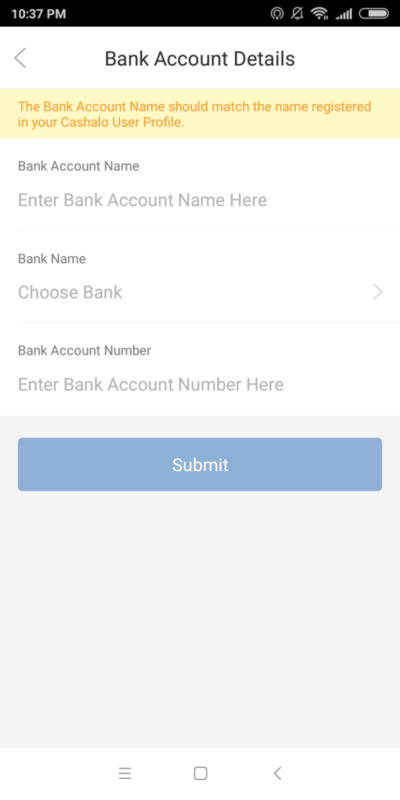 It is imperative that your bank account MATCHES your user profile in Cashalo, otherwise, you won’t be able to get your money or your loan application might be rejected. 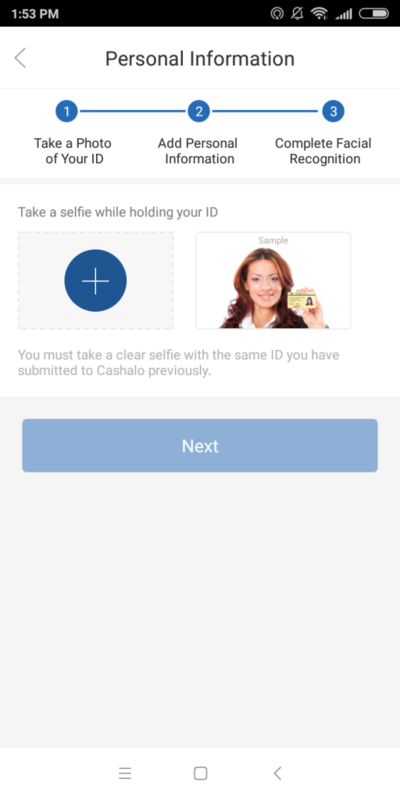 Complete your loan application with online facial recognition. 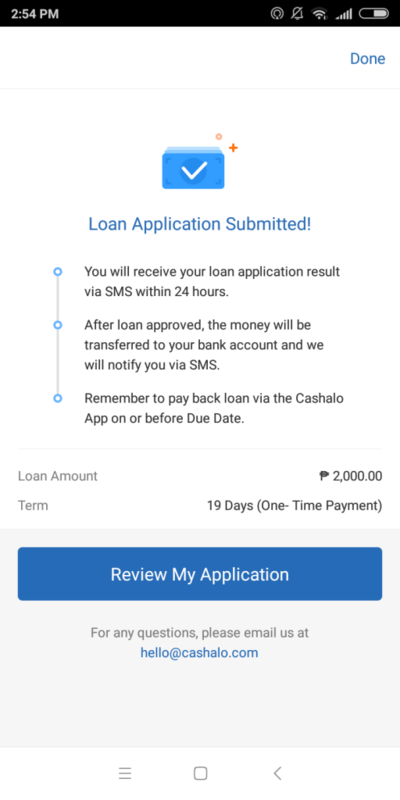 As soon as you completed the steps, Cashalo will redirect you to a page indicating that your loan application was submitted. Cashalo will review your application within 24 hours and if approved, the amount will be deposited to your nominated bank account. Are you ready to give Cashalo a try? Make sure you have an ID with you to speed up the loan application process. “We believe in you,” says the tagline of RCBC or Rizal Commercial Banking Corporation. Despite being caught in a controversy, RCBC is business as usual and constantly providing products fit for every consumer. One of the financial products offered by RCBC is MyCash Loan, which is their version of personal loan. You can use this loan to pay off bills, school-related expenses, home improvement, purchase of new gadgets or appliances, vacation, and other personal needs. More than this, RCBC also offers counselling services and advice, including best options on how to pay for your monthly amortization. Here’s everything you need to know about this facility – features, requirements, how to apply, and tips – in case you decided you need one. Late payment charge of 5 percent p.a. Fill out the MyCash Loan Application form. Submit the application form together with the required documents in any RCBC branch. Loan processing will take five to seven days. You will be informed of the status of the application thereafter. If approved, you can now withdraw the funds. Take note that as of this writing, there is no online application available for MyCash Loan. You may go directly to the nearest RCBC branch to request for an application form. Make sure you are a credit card holder. This will help RCBC (and any other banks) check how financially responsible you are. Prepare the documents. Make sure it is complete before going to the bank. Checking account is a MUST. RCBC prefers checking account from them, but they will accept PDCs from checking account with other banks. You might be wondering why Metrobank doesn’t have a Personal Loan facility. The answer is simple: its subsidiary, Philippine Savings Bank or PS Bank offers this kind of loan facility. In that case, say hello to PS Bank Flexi Personal Loan with Prime Rebate. It is the first and only non-collateral personal loan with fixed term loan and revolving credit line. This facility has lower interest rate with the interest applied only on the amount used and not on the entire amount approved. Revolving credit line, which means this is a type of credit with no fixed number of payments. In fact, the amount you can borrow decreases or increases depending on how much you repaid. Loan rebate program wherein you will receive rebate or savings every time you make advance payments or pay an amount in excess of what is required from you. Take note that the rebates earned are computed on a daily basis. Completely filled out application form. You can get a copy here. Fill out PS Bank Flexi Personal Loan application form. You can get your copy here. Wait for one to three days for credit decision. If approved, submit documentary requirements needed to book your loan. Your PS Bank Flexi ATM card and temporary PIN will be delivered to you upon submission of all requirements. Wait for five to seven days for Metro Manila and seven to nine days for provincial customers. Use the ATM card to withdraw the approved funds from your loan application from any PS Bank, Metrobank, Bancnet, MegaLink, and ExpressNet ATM networks nationwide. You can also request for the issuance of PS Bank Flexi Personal Loan checks to withdraw the funds. Own at least one credit card with YOU as the principal credit card holder. Completely and honestly fill out your loan application form. Make sure you don’t have any past due accounts. Negative credit standing will reflect poorly on your loan application. Are you ready to apply for one? EastWest Bank is one of the fastest-growing bank nowadays. To keep up with the growth and trend, the bank continuously offers products fit for every member of the society. This includes personal loan, a multi-purpose loan that is designed to suit your financial needs. This is open to everyone (as long as it is within the age limit), which you can use to pay off bills, renovate your home, investment, or for your child’s education. Photocopy of at least one valid government-issued ID. 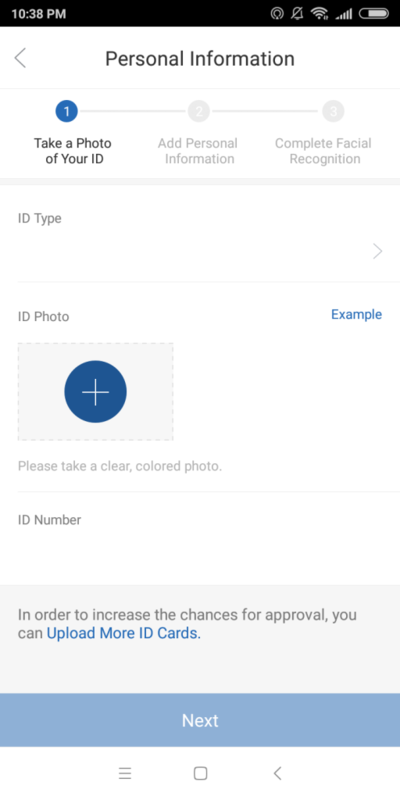 You can also check out the list of acceptable IDs here. Fill out the online application form. You can access it here. Attach scanned copies of the required documents for reference. Loan processing will take some time. You will also be contacted by the bank’s representative for additional instructions, so make sure to check your email regularly. Submit all necessary requirements, especially proof of income, to facilitate faster processing and approval. Own a credit card or at least consider getting one if you plan to apply for the bank’s Personal Loan facility. Having one (and making sure you pay on time) gives EastWest Bank an impression that you are a responsible borrower. “We find ways,” according to BDO, one of the biggest banks in the Philippines. True to its word, BDO offers various facilities to help every Filipino in case financial difficulties or simply for additional funds. One of the loan facilities offered by the bank is Personal Loan. The facility can be used for variety of reasons like medical emergencies, travel, home upgrade or renovation, purchase of appliance or gadgets, health and wellness, debt consolidation, payment for tuition fee, and other personal expenses but you fell short of cash. Interest Rate: varies, depending on the loan term. If payable within six months, interest rate is at 1.3 percent. For 12, 18, 24, and 36 month-loan term, the interest rate is 1.25 percent. Fill out BDO Personal Loan application form. You can download it through BDO website or request a copy from any BDO branch. Submit the application form together with the requirements listed above. Wait for seven to 10 working days loan processing. If approved, you will immediately be informed of the status of your loan application and proceeds will be credited to your BDO account. Submit all requirements needed by BDO. This will make loan processing faster if the documents needed by the bank is complete. Make sure you don’t have existing bad credit or unpaid loans. Existing loans are fine as long as it is being paid regularly. On the other hand, loans that are unpaid or past due is a big no-no for BDO and could cause rejection of your loan application. Pay bad credit to increase your chances of approval. Your proof of income is vital. Make sure you can prove to BDO that you are capable of paying the loan despite existence of other expenses. Take note that the post discussed BDO Personal Loan only, which is DIFFERENT from BDO Kabayan Program, a loan facility that specifically targets OFWs. The BDO Kabayan Program will be discussed in a separate post. First of all, congratulations. You’re doing a good job in your work in order to provide a better and comfortable life for your family. Apparently, it’s not easy to make ends meet and ensure that every bill that comes to your doorstep will be paid while mouths are well-fed. In some cases, your supply of cash will fall short – and that’s okay. In case you need cash to pay for your child’s tuition fee or medical bills in the hospital, BPI is there to help. One of the oldest and most stable banks in the country, BPI offers a type of loan facility that will help fulfill your financial needs while offering a competitive rate. The BPI Personal Loan is multipurpose loan designed to fit your personal needs such as home improvement, medical, education, purchase of appliance, travel, or anything business-related. An email notification will be sent to your provided email address to verify that your Personal Loan application was received. Wait for five to seven banking days for the status of your loan application. If approved, the proceeds of the loan will be credited to your BPI account within one to three banking days from the signing of loan documents. Completely fill out the online application form. Incomplete data will result to delay in the processing of your loan application. Make sure you have an existing BPI account. If a question does not apply to you, then write NA instead of leaving it blank. You must be able to provide at least two personal references, preferably someone who can attest to your financial responsibility. Be honest about your existing loan/s and credit card/s. For foreign applicants, make sure you provide your ACR number. Make sure to submit your loan application anytime between 8:30 am and 5:30 pm from Monday to Friday. Any application submitted beyond the scheduled banking hours or on weekends will be processed on the following day or the following Monday, respectively. Submit the required income documents. This is imperative because bank representatives will determine your credit-worthiness based on your proof of income. Do you need a new TV or ref just because the old one decided to give up on you after 10 years? As much as you want to buy a new one, you’re short in cash and there are bills waiting to get paid. This is where Home Credit gets in the picture. A part of Home Credit group, Home Credit Philippines offers financing services through non-cash and no-collateral in-store financing. If you happen to have little or no credit history, Home Credit can still extend credit to you to help you boost your rating. Despite the promise of easier loan application, we noticed that not everyone who applies get approved. Some even claim that they have higher income yet they don’t get the result they were hoping for. To help you in this dilemma, we listed several tips to help you get approval from Home Credit. Tip No. 1: Pay off overdue or unpaid loans from other creditors. Just like any other lenders, Home Credit uses the information from the SEC’s Credit Information Corporation. This means they can see who you owe money to, how much, and how frequent you pay your creditors. Any signs of unpaid loan/s is a red flag for them, thereby affecting your loan application. “But I have other loans from other lenders,” you might say. That’s fine, as long as you pay on time. Tip No. 2: Disclose existing financial obligations. You might be scared to tell Home Credit that you have existing personal loan from Bank A and a housing loan from Bank B. You badly need to credit, so you want to make your record to look as clean as possible. Don’t do that. Again, Home Credit uses the CIC, which means they can see your credit history. Even if you don’t disclose, they will most likely find out about it and take it against you; hence the rejection of your loan application. Tip No. 3: Pay a higher downpayment. Yes, Home Credit extends a helping hand so you can buy the item/s you need. Still, this doesn’t mean the responsibility lies solely on them. One of the secrets for getting approved is by paying a higher cash-out. If you can provide the highest downpayment, then there is a higher chance of approval. The good thing about this is that you will have lower instalment every month. Tip No. 4: Let them know about what you own. It’s not bragging. It’s about telling a potential creditor that you are capable of paying a loan and that they have nothing to worry. One of the issues mentioned by previous Home Credit clients is that Home Credit asks for referrals and will call them in case of delay in payment. You can prevent this from happening by disclosing your assets. Tip No. 5: Don’t forget your ID. If you are unable to submit two IDs, then you can support it by presenting a secondary ID like utility bills, company ID, credit card, TIN ID, NBI clearance, Philhealth card, salary slip, or barangay clearance. Tip No. 6: Pay Home Credit earlier and not on the due date itself. This has been a common practice among Filipinos. Unfortunately, it’s not a good sign for lenders, including Home Credit. If you plan to re-apply, Home Credit will appreciate if you pay BEFORE the scheduled due date. This will speed up loan processing as well. Still, this doesn’t mean that following these tips will guarantee 100 percent approval. At the end of the day, it will all depend on Home Credit and everything we listed here serve as a guide to increase your chances of getting approved.